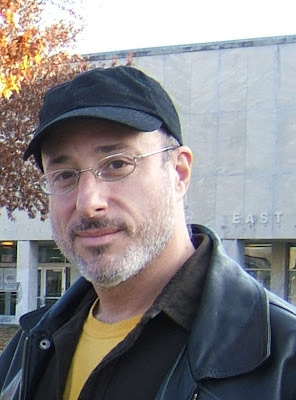 Mark Shulman is the author of Scrawl , Mom and Dad Are Palindromes, and Fillmore And Geary Take Off! The Adventures of a Robot Boy and a Boy Boy, among many others. Click here to read my review of Scrawl. Mark Shulman has been a camp counselor, a radio announcer, a maitre d' in a fancy restauraunt, a New York City tour guide, and a creative advertising guy. He's written many books about many things--sharks, storms, robots, palindromes, gorillas, dodo birds, Star Wars, Ben Franklin, how to hide your stuff, how to voodoo your enemies, and how to make a video from start to finish. He's written picture books for Oscar de la Hoya (the boxer) and Shamu (the whale). Mark is from Rochester and Buffalo, New York, but he has lived in New York City for so very long that he tawks like he's from da Bronx. So do his kids. His wife Kara, a grade school reading specialist, has perfect diction. Aargh. My first question and already I’m stumped. My little apartment has more books than some of the bookstores I’ve been to. How can I answer that? Which three? First three ever? Most recent three? Three favorite children’s books as a child? As an adult? How about the three books most frequently re-read, regardless of age or genre, and so loved that the word should savored in the British style, with an extra u: favourite. The most re-read book in my world is The Thurber Carnival. James Thurber is my first writing teacher, a master of humor, style, and social commentary . I’ve absorbed so many twists of story and turns of phrase from his work that I should send flowers to his grave every year. Second is probably The Maltese Falcon. It’s not just a perfect detective story and a perfect mystery story and a perfect set of character sketches. It’s perfect. I love that Dashiell Hammett wrote it mainly to outrace the creditors, in a small apartment with young children. I can identify. And finally, a late addition to overtake Twain and E.B. White for the bronze medal: Holes by Louis Sachar. Reading this particular book is like watching an up-close magician who will repeat the trick over and over again, yet I still don’t altogether get it. It’s on my bedtable right now. I’m lucky that my wife runs the reading program in her public elementary school here in New York City, and we live near a great library branch. So, there are plenty of new books to read, and I’m always in books or newspapers or their digital cousins, as well as reading aloud to my kids on a daily basis. I’m also lucky that writing is my full-time job, and I’ve been able to publish a lot of books since I hung up my advertising spurs ten years ago. Also also, I’m perhaps lucky that my wife puts a lot of time into her schoolwork after hours, so I’m free to keep writing into the night. My weeks fluctuate wildly, and I count the time spent sitting at a computer in fruitless expectation to be the same as actual writing time. So: 25 hours reading and 25 hours writing something. The path led down Madison Avenue, in a couple of ways. My first career was as an advertising creative type… brainstorming, presenting, writing, and eventually becoming creative director in a variety of worlds: agency, magazines, events, and communication consulting, whatever that is. This was an excellent training ground for writing craft, not to mention discipline, audience empathy, and lack of vertigo with authority figures. I was like the boy in Karate Kid, picking up moves I didn’t know I would need later. (For instance, turning long lists into long sentences.) Also, I used to give lots of tours in New York City. That’s where I learned to absorb, present, and arrange history to suit not only my narrative, but any sudden bus detour. Once I met my wife the teacher, I traded all kinds of predictability for more creative satisfaction than I’d ever imagined. My publishing life didn’t begin with rejection. I still thought like a professional, so I scheduled meetings with publishers and editors who may not have realized that I was thoroughly inexperienced. I pitched my book ideas as if they were ad campaigns, and I suppose being confident and somewhat funny helped to sell a few of them. Over time, as my writing evolved, my sales pitches dwindled, and I got more and more chances to write. Hmm. I’d say Art is born, Craft is taught. The talented people invent plays and stories and kindle their imaginations at a very early age, but that doesn’t ensure they’ll learn Craft. The motivated people listen and learn and persevere, but their dedication may not bring them closer to Art. The fortunate ones start in one place and evolve toward the other. Personally, I’m a creative type, radiating ideas the way a hunk of uranium radiates, well, radiation. Hooked up to the right machine, I’m useful. Out in public, the results may vary. But I’ve always identified as a writer. I like variety. I’d like to write and publish one of everything before I’m through. Finally, an easy-to-answer question! My favorite thing is that I love the beginning. That’s when I happily agree to complete something with no way of knowing how it will turn out: the deadline, the tone, the style, certainly the ending, and definitely the deadline. Yet I enter into writing with the confidence that I can pull it off. And when the work comes together, as it eventually always does, my faith in the writing process becomes even stronger. My least favorite thing – no joke – is the misery I feel when I realize that, yet again, I’ve committed to something I have NO way of feeling my way through. I’m lost in the dark every time, and every time I curse myself for not being a predictable, repetitive writer. When I finally reach the end, I solemnly swear that I won’t do this to myself again. This may seem schizophrenic and counterproductive, but it is. My advice comes more from what I would tell writers in advertising and marketing. It all applies to books. 1) Really learn to type well. 50 words per minute, minimum. At that rate, it’s much easier to get the words off your mind and onto the paper. Treat typing software like a video game and get good. 2) Get the words off your mind and onto the paper. Don’t edit or second guess while you’re blurting. Just blurt. You know more than you think you know, said Dr. Spock. 3) Talk like your narrator. Find the appropriate tone and stick with it. 4) Be your reader. Imagine what your reader would like to hear, and give it out generously. Talk directly to your reader as an individual. Don’t play to the room. 5) Know that readers don’t have to be reading your writing, so keep pulling them forward with little gifts. A clever turn, or a good joke, or something unexpected in the wording or pacing keeps building the good will. 6) Keep up with the white space. Most younger readers perceive a seven-line paragraph the way you perceive the original Declaration of Independence. 7) Know in your gut which advice to absorb immediately, and which advice to ignore. But listen to all of it. 8) Be yourself. Write what you know. Stop reading lists. Start writing. Etc. If I’m inviting this writer for the conversation, I pick James Thurber. His stories are master courses in how to unspool a tale, and his peers all say he was a superb storyteller in person. However, if this lunch is doubling as a one-on-one literary critique, I’m reserving a large table for the afternoon at the Algonquin and a cup of red pens so E.B. White will have plenty of room to work. Uninterrupted. I can't believe this is his first book. You can tell a lot by the way he answers the questions. He is funny. This was an AWESOME interview. Absolutely loved Question Two- very inspiring. I adore Mark! I had the pleasure of working with him before he hung up his advertising spurs. I just Googled him and found this great interview where his humor, kindness, and wisdom comes through. I miss you Mark!